All Saints Notting Hill is a Victorian Anglican church in Talbot Road, Notting Hill, London. It is a Grade II* listed building, built of stone with polychrome decoration in the Victorian gothic style. The west tower has five stages with the stump of a spire, and the sanctuary features paintings by Henry Holiday. The church was badly damaged by enemy action during World War II but was fully restored by 1951. Construction on All Saints church was originally begun in the mid 19th century by the Reverend Dr Samuel Walker, following designs by architect William White, working with Sir George Gilbert Scott. The church was to be the centerpiece of the development now known as Colville and Powis Squares. Walker was deeply religious and his vision was for a "free and open church" which would be a spiritual centre for the newly built neighbourhood. Unfortunately, he experienced severe financial difficulties and was eventually declared bankrupt. The building was left unfinished for several years, lacking a spire, and remaining unfurnished, during which time it became known as All-Sinners-in-the-Mud. It was eventually completed in 1861, by The Rev. John Light of Trinity College Dublin, at a cost of £25,000. The spire envisioned in White's original designs was never completed. 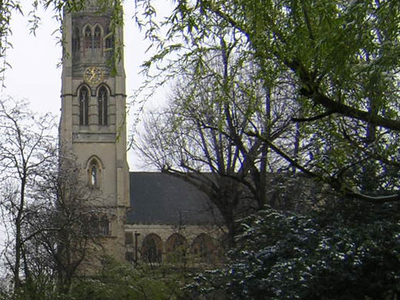 Here's the our members favorite photos of "Churches in London". Upload your photo of All Saints Church!